Oh. My. Goodness. I think I have outdone myself on this one. 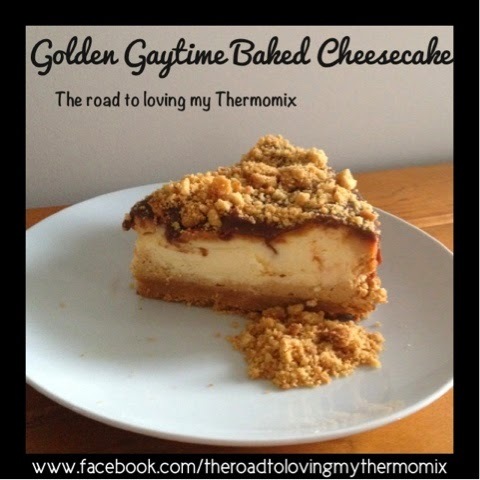 Golden Gaytime Baked Cheesecake!!! This is a caramel and vanilla baked cheesecake with a chocolate ganache on top of a caramel biscuit base. Oh and a little biscuit crumb on top! Now we are all going to close our eyes, cover our ears and pretend there are no calories in this ok? Those that know me know I LOVE Cheesecake! I love thinking up new ideas and have been toying with this idea for some time. I’m off to my brother in laws house for dinner tonight and in charge of bringing a dessert (as well as tmx pizza dough of course!). Perfect excuse to experiment! This is a baked cheesecake and something I’m not overly familiar with. I tend to stick non baked ones out of laziness. 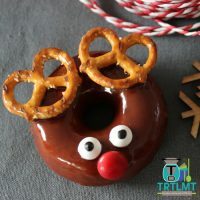 I will give this one a whirl in a no bake variety as well for kicks. You can never have too much cheesecake right!? Its important to remember that this is a cheesecake. This will taste different to the ice cream due to different ingredients such as cream cheese which has a very distinct taste. This is a caramel and vanilla baked cheesecake with a chocolate ganache on top of a caramel biscuit base. Oh and a little biscuit crumb on top! Now we are all going to close our eyes, cover our ears and pretend there are no calories in this ok? Preheat oven to 180 degrees. Line two baking trays with baking paper. Blitz on speed 4 until pale. You may need to scrape down the sides a few times. Add vanilla, golden syrup and sugar. Blitz on speed 4 until well combined and creamed. You may need to scrape down the sides a few times. Blitz on speed 4 until a soft dough forms. Roll into small balls. Place onto tray spaced apart. Using a fork, press down slightly on the biscuit. Bake until lightly golden. Approx 15 minutes. Preheat oven to 170 degrees if not on already. Once biscuits have mostly cooled add all of them bar three to the tmx bowl. Blitz on speed 7 for 10 seconds. Add cubed butter (100g) and blitz on speed 5 for 30-45 seconds until a dough forms. Press into a lined springform tin. 22cm+ is best. Bake in the oven for 15 minutes. Set aside. Wash bowl out of crumbs. Add cream cheese and sugar. Blitz on speed 6 until smooth. You may need to use your spatula. Blitz on speed 6 until slightly combined. You may need to use your spatula. It may be a very firm mixture depending on your cheese but once you add your eggs it will become runny quite quickly. Add your eggs one by one with blades spinning. Stop and scrape down the sides. Blitz again on speed 5 until completely smooth. Pour out 1/3 of the mixture into a jug. Set aside. To the bowl add the top n fill. Blitz again on speed 5 until completely smooth. Be sure there are no lumps. Pour 1/2 of the caramel mixture over the base in the springform. Pour over all of your vanilla mixture and then top with the remaining caramel mixture. Keep in mind that it will rise slightly. Do not over fill your pan. It wont end well. Bake for 50-60 minutes or until firm. Do not over cook or it will crack. Once done turn off the oven and leave it to cool in there. Once cool, transfer to the refrigerator. It is best to leave overnight if possible. My ganache is a little different. I didn't have cream so used butter and milk. 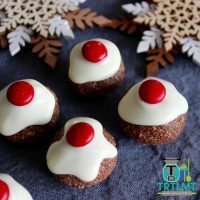 You can of course make yours the traditional way with chocolate and cream. Refer to your EDC. Place milk and butter into a clean and dry tmx bowl. Melt on speed 2, 60 degrees for 4 minutes. I find the slightly higher temperature works better. Add your chocolate to the hot liquid and blitz on speed 3 until combined. Remove and let it cool slightly, whisking every 10-15 minutes or so. Meanwhile with your leftover caramel biscuits, pop them into a clean and dry tmx bowl (or use a bag and rolling pin) and blitz them on speed 6 for a few seconds. You want some fine and coarse crumbs. When cheesecake and ganache are cooled, pour ganache over the cheesecake. Top with crumbs and leave in the fridge until ready to serve. You want your ganache to firm up. Cut with a hot knife (run under water before cutting). 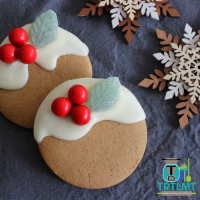 You can use a standard plain biscuit for the base in place of the caramel biscuits. I recommend placing a tray underneath the springform to collect any drips that may occur. What was the verdict? Looks delicious!! This was amazing! 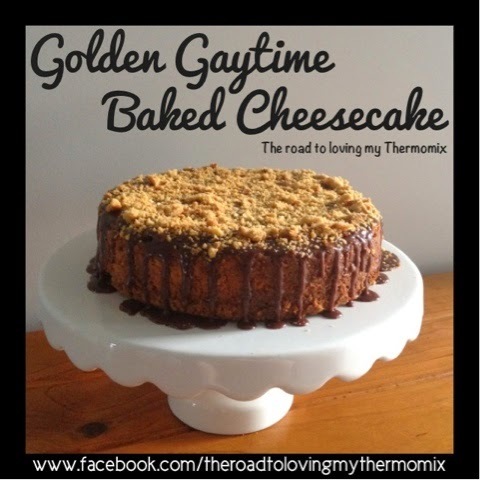 Will make this again next time I am asked to bring dessert somewhere! People ask me why I’m not the size of a house, I say I’m just the enabler. Having said that. This is glorious. Well done you. How much would you need if you use store bought biscuits please. made this for a family bbq and it was a winner! There are lots of steps but it was quite easy to make and so tasty, thanks! i generally don’t bake cheesecakes much. 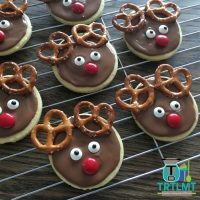 If you do a non bake one will you update this recipe? I might give this baked one a go, looks sensational! I made this a few months ago for a family gathering. 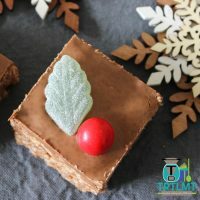 I personally found this so rich and sweet I couldn’t finish my (small) slice but my mum, SMIL, kids and husband had no such trouble (ok hubby needed to do several shifts but it was clearly too good to leave on the plate). I made the biscuits and caramel condensed milk the day before baking the cake. I also made a bit of honeycomb for garnish along with the biscuit crumb. In fact I made the biscuit dough two days prior and rolled it into a log and put in the freezer, then just cut into slices before baking. It worked well since how they looked didn’t matter at all. Due to the richness this cake goes a long way!